The school of Prof. Krishna Kumar continues to produce winners. In the recent past there have been some excellent books on education and most can be traced back to a common (however tenuous) link: Prof Krishna Kumar. However, this observation is not meant to detract from the achievements of the individual authors – each of whom demonstrates a distinct competence and style. 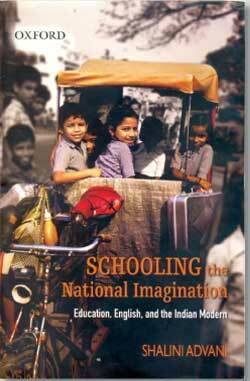 Schooling the National Imagination by Shalini Advani adds to the list of good books on education that we have seen in the recent past. A non-ideological enquiry into the political agenda of education, it comprehensively maps a territory that has not been sufficiently explored. Schooling the National Imagination traces the historical journey of the ideological debates that have informed policy, curriculum, texts, classroom transactions and attitudes since India’s independence. The book explores, through the various shifts over the past 60 years, the vexed relationship between language and modernity and a nationalist identity – which, within a postcolonial setting gets even more complex. The book is divided into three sections. The first section, ‘The Policy Landscape’, concentrates on the ideological and policy shifts. This section is further divided into three chapters. In each of these, Shalini Advani concentrates on a particular component: the nationalist identity, language and what Indian society sees as the role of education. Thus, the first chapter examines what it means to be a “true Indian”, the second chapter explores the predicament of the relation with the language of the colonizer in a post-colonial nation and the third concentrates on the “overall framing vision of education in India”. The second section entitled ‘The Culture of Text-books’, concentrates on changes in the textbooks. This section is again divided into three chapters The Construction of the Nation, Normalizing Boundaries, and Engendering the Nation. The first examines how the national policy enters into the classroom through the textbooks. In the second chapter, there is an attempt to describe an ideal citizen, as well as to reveal who is included or marginalized. It also looks at the construction of “the non-Western, modern” citizen. The last chapter in this section examines how gender roles are depicted in textbooks. The third section, ‘Entering the School Gates’, takes us right into the classroom. It shows how ideology, policy and the textbook unfold in the classroom. The conclusion maps the connections and new tensions between “Nationalist Pedagogy, Sub-national Identities and Transnational Desires” in the present day. Schooling the National Imagination would be of immense use to all interested in studying the inter-connections between ideology-policy, curricular reforms and classroom delivery. From the deliberations at the top to its transaction in the field, the book shows clearly how an ideology, through policy and curriculum informs textbooks and how these, in turn, play out within a classroom between the teacher-student. Shalini Advani’s book gives one both a wide angle shot of the historical perspective and a microscopic, vertical picture of the three issues – language, modernity and national identity – that continue to engage “the national imagination”. The book is worth reading for its enquiry into the politics of two very interesting issues of language and self-identity in a post-colonial situation. Students and researchers will find the book studying for its worth-emulating methodology. The only amendment that I would suggest to this very competently written book is a change in the title. It is evocative but, I think, not accurate. Even if one could pin down what a “national imagination” might be, it would still be impossible to ‘school’ it, given the norm of rote-learning. Thus, an apt title, I think, would have been Attempting to School the National Identity or Schooling and the Nationalist Identity! The author is founder Centre for Learning, which aims to offer alternative education to all children. She can be reached at kaur.gurveen@gmail.com.